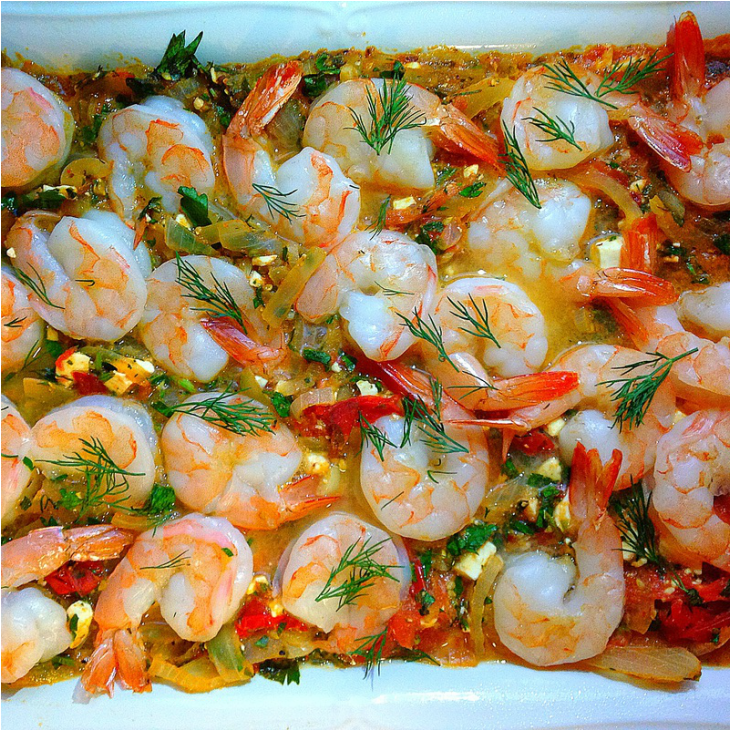 It's been a long time since I've been able to get on here and post some yummy recipes! I've been so busy the past 6 months, but I'm back and ready to get cooking'! 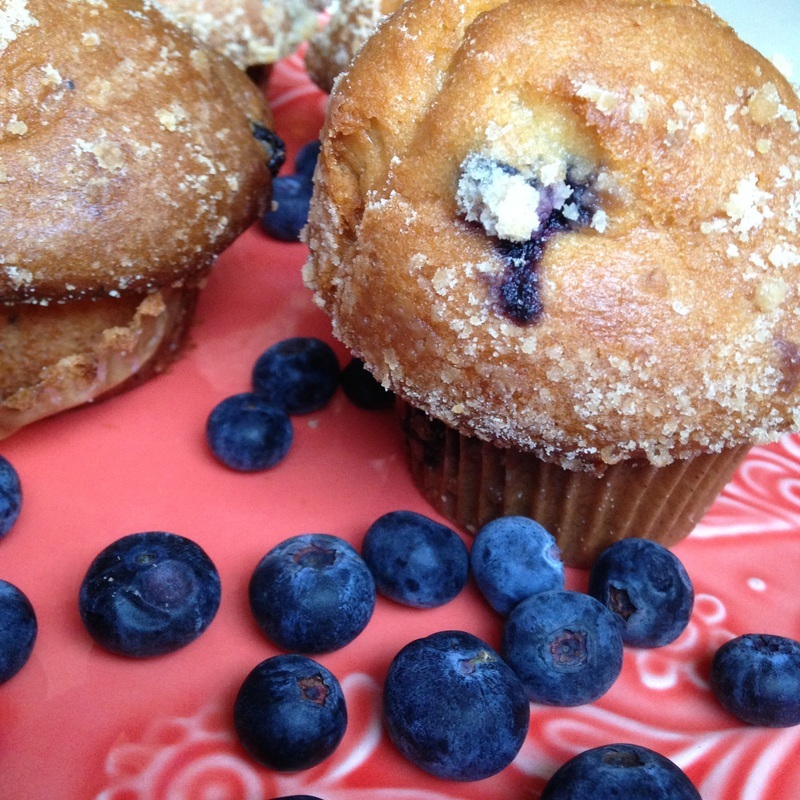 These energy bites are jam-packed with protein and deliciousness. Preheat the oven to 350 degrees Fahrenheit. Spray a cake-pop baking pan with nonstick cooking spray. Mix all the ingredients together really well. Form them into perfectly round 1.5-inch balls. Place in baking pan and then in the oven for 10 minutes. Let cool before handling them. 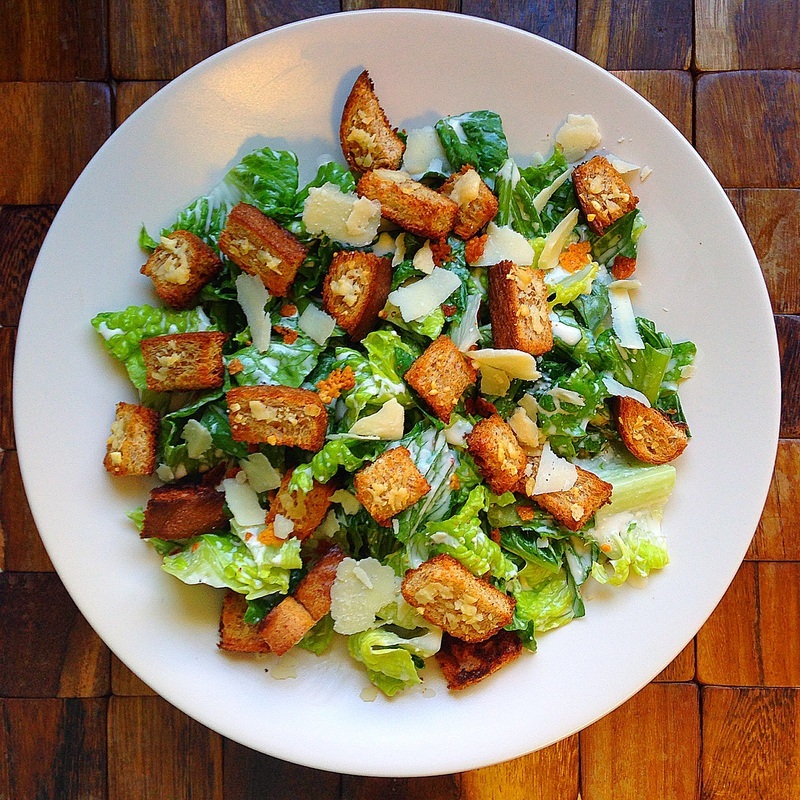 This is pretty much the best caesar salad I've ever had and you wouldn't even believe how healthy it is! 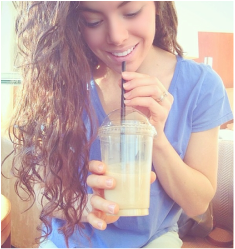 Not to mention there aren't any eggs or anchovies in the dressing (your welcome). 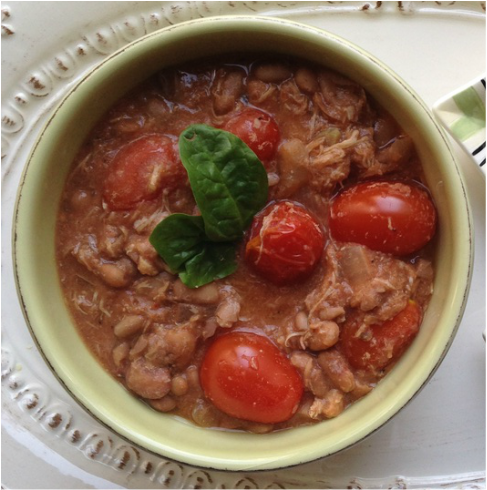 You will absolutely love this recipe, guaranteed :). This recipe makes 4 servings. Preheat oven to 350F and spray a flat baking pan with non-stick cooking spray. Slice the four pieces of toast into 1 inch cubes to make the croutons. Lay the croutons flat onto the pan making sure they don't touch each other. Spray the top of the toast with more non-stick cooking spray and then sprinkle on the 2 tbsp of grated parmesan cheese trying to get it on top of each crouton. Bake in the oven for 10 minutes or until they turn golden brown. To make the dressing, simply place all of the ingredients into a blender and blend on high until everything is mixed in really well. To assemble the salad, place the romaine lettuce into a large mixing bowl and toss with the dressing. 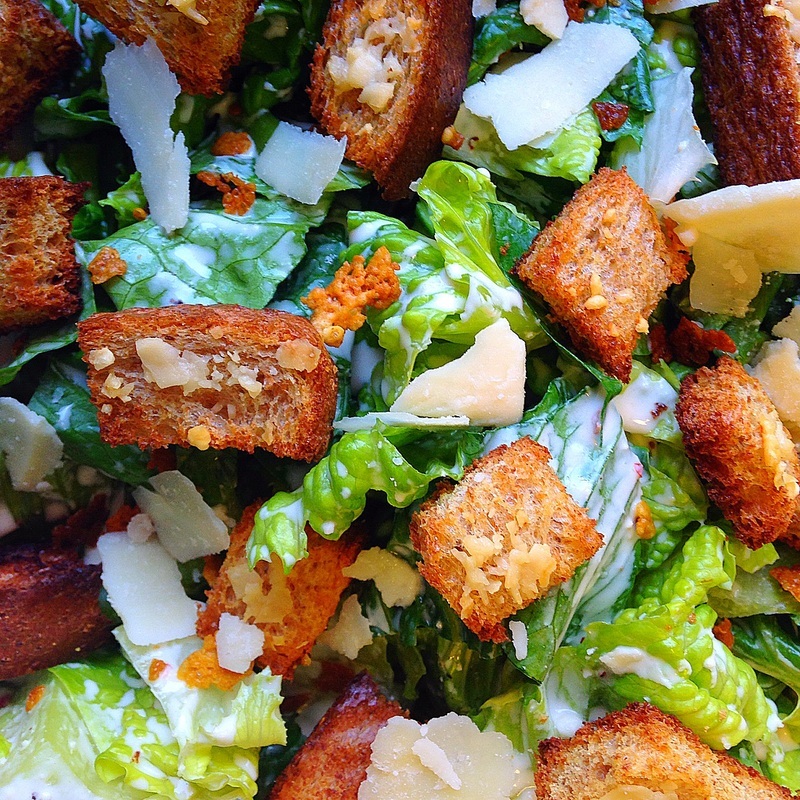 Sprinkle on the 4 tbsp of shaved parmesan and top with the croutons. It's amazing :). 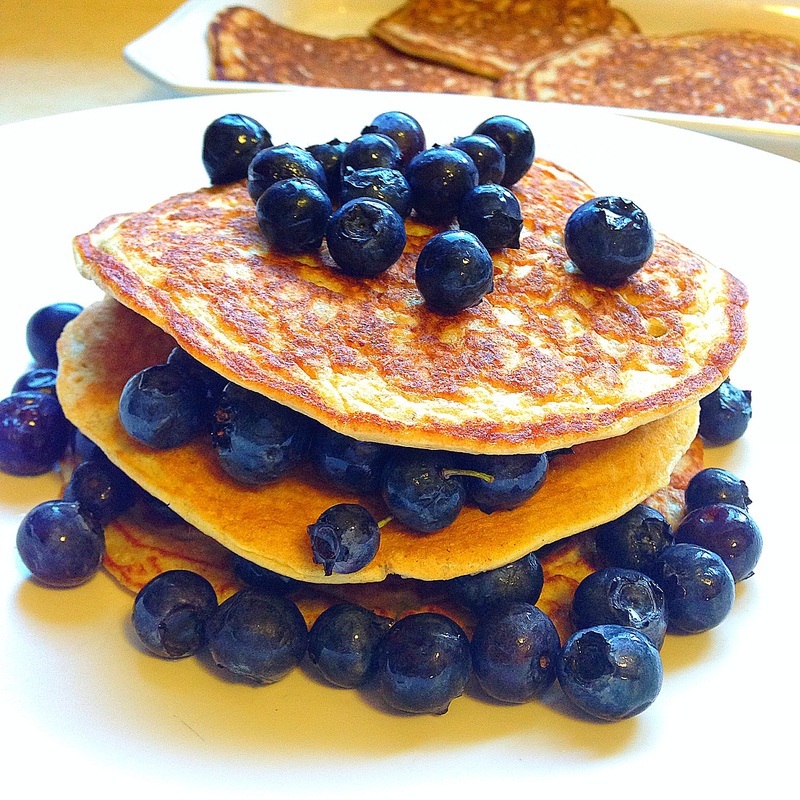 I know I've posted a few recipes for oatmeal pancakes already, but these are definitely my favorite out of the bunch! They cooked so perfectly and taste amazing! I drizzled some homemade date syrup which is also another favorite of mine from my blog but I'll go ahead and repost the recipe for that since it's so simple and delicious :). 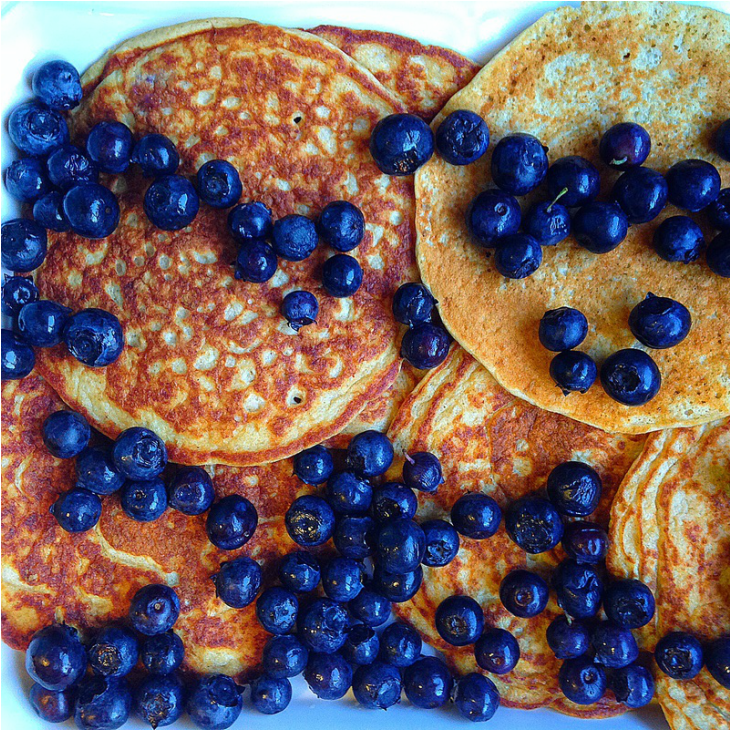 Prepared my way, each pancake is around 80 calories without the fruit or syrup. In a high-speed blender, add all of the dry ingredients; oats, baking powder, salt, and Splenda. Blend until it forms a flour. Add the milk, eggs, vanilla, and banana and blend on high for about another minute or so until it forms a batter, which will still be slightly lumpy. Spray a skillet with non-stick cooking spray and turn the fire to medium-low. Pour the batter into the skillet, forming what ever size pancake you prefer. I used about 1/3 of a cup of batter per pancake. Let cook until bubbles form, and flip to cook the other side. The recipe will make around 9 pancakes using 1/3c batter per pancake. 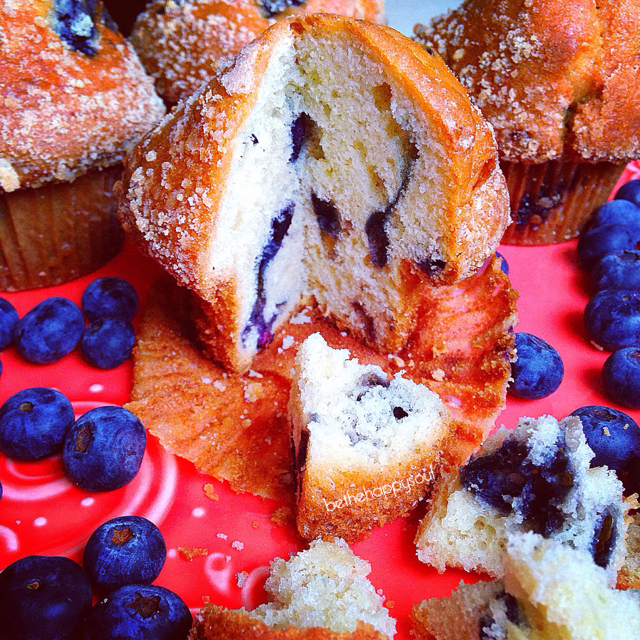 Serve with fresh fruit of your choice. For the syrup, simply add the pitted dates and water to a small pot and cook on medium fire until a syrup forms, stirring occasionally. If the syrup is too thick simply add more water until you get the consistency you're looking for. The name of this dish is very confusing and doesn't match up to the photo what so ever.. I mean, since when are sloppy Joe's healthy? And why are these made with chicken? And are those wraps instead of buns? Yup, these are my super delicious and healthy twist on your old fashioned sloppy Joe. My neighbor actually inspired me to make this dish. He yelled from his driveway, literally, "Lena! I just ate sloppy Joes!". I thought to myself, and out loud, I haven't had that since I was 7. So naturally, I walked into my house and cooked up this heavenly storm. I made it in the slow cooker which is just my bestest of all best friends lately. My husband and I ate this all day long and then some. Place all of the ingredients, except for the feta cheese, into the crock pot and let cook for 6 hours. Using a large fork, mix everything up really well so that the chicken shreds into little pieces. When you're ready to serve it, toss in the feta and mix it in with the chicken. 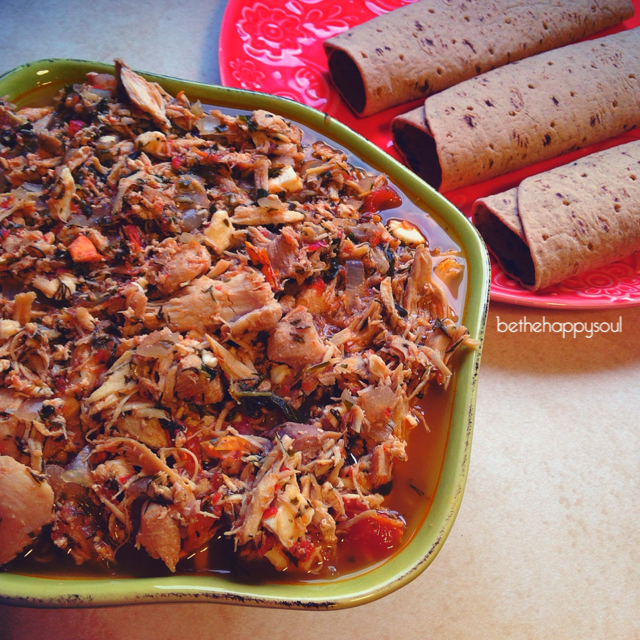 Serve with whole wheat wraps of your choice. The wraps I used are called Flat Out. Preheat the oven to 400 degrees Fahrenheit. In a blender, add all of the ingredients except the chocolate chip morsels. Blend on high until smooth. Grease the bottom and sides of a 9" by 9" baking pan with butter. Pour in the mixture and evenly spread it out. Sprinkle the top with the chocolate chips and bake in the oven for 15 minutes. 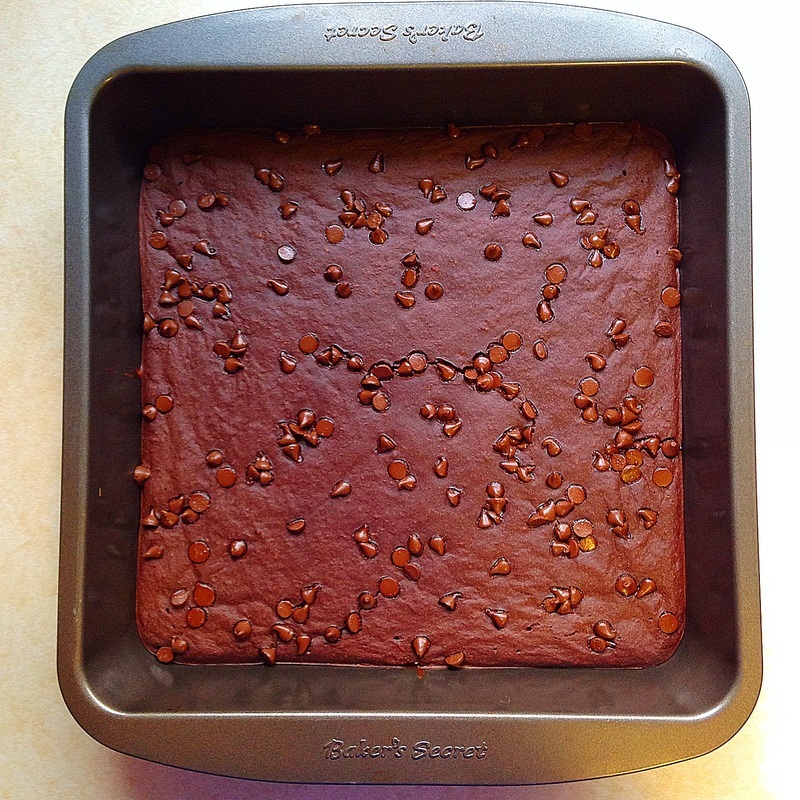 Once completely cooled, cut into 9 equal squares and serve. P.S. they taste unbelievable when you pop them in the microwave for a few seconds before indulging :). Boy oh boy was this absolutely delicious. 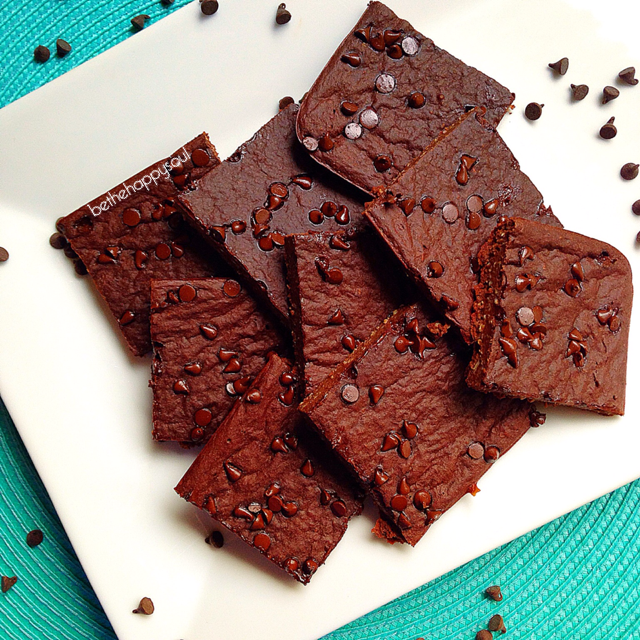 Such a light treat, perfect for those late night cravings when you're trying to stay away from carbs. I didn't add any rice to this roll but I'm planning on experimenting with brown rice rolls very soon. I can't wait! But for now, you guys seriously have GOT to try this. My husband scarfed it down the second I was done taking the photo.. now I know that next time I need to make 4 servings instead of 1. I didn't realize how yummy this would be. 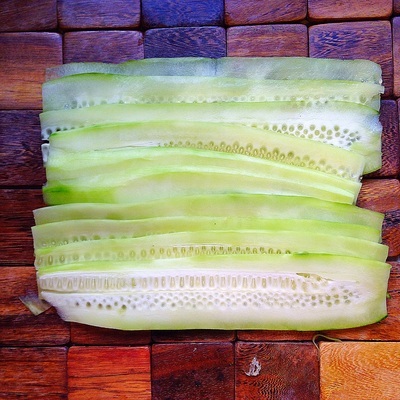 Peel the cucumbers and slice thin pieces down its length to make strips. They should be thin enough to be flexible when you roll them but thick enough to be sturdy and not break. Once you've made all your strips, roll each one leaving a generous hole in the center for the stuffing and pierce through with a tooth pick to maintain it. 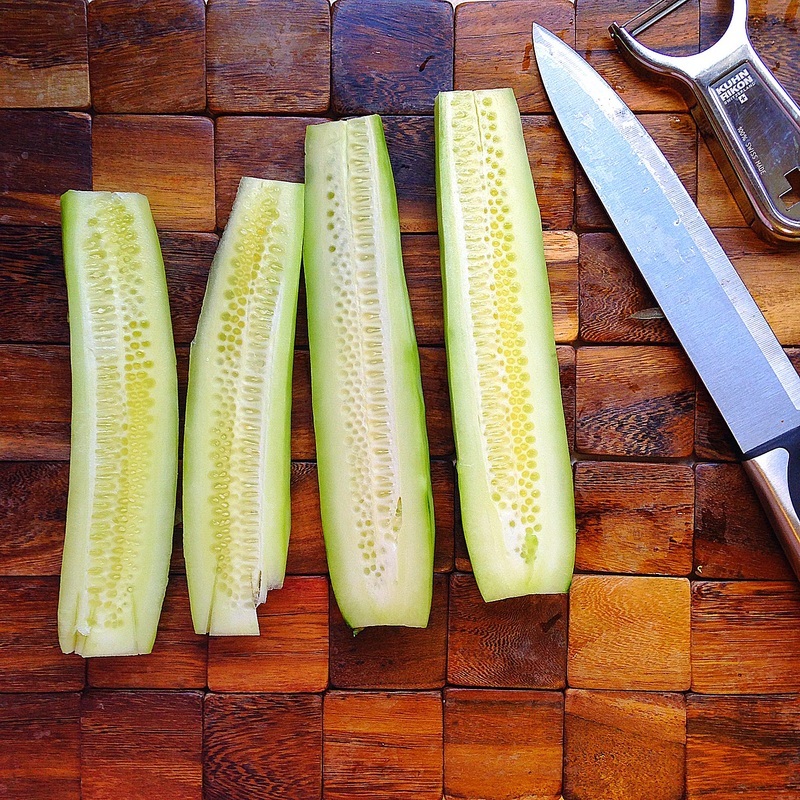 When you push the toothpick through, try to remain close to the edge of the cucumber so that it doesn't block you from filling them. Peel the carrots, and thinly slice them down their length. I used a vegetable peeler to shred them and then sliced the shredded strips in half. It really doesn't matter how you do it, you could even use store-bought shredded carrots. If you buy the crab meat flaked, it should come in strips which is perfect to use when making sushi. I just cut each strip into three separate pieces about an inch long . 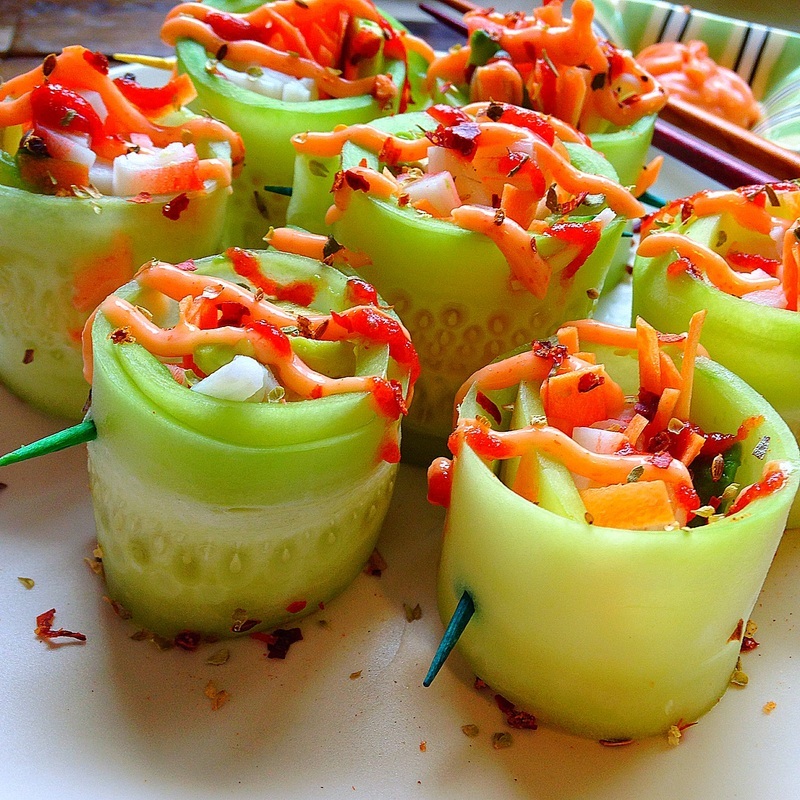 Take a little bit of each ingredient, carrots, crab, and avocado, and tuck them into the cucumber rolls, stuffing them to their max. 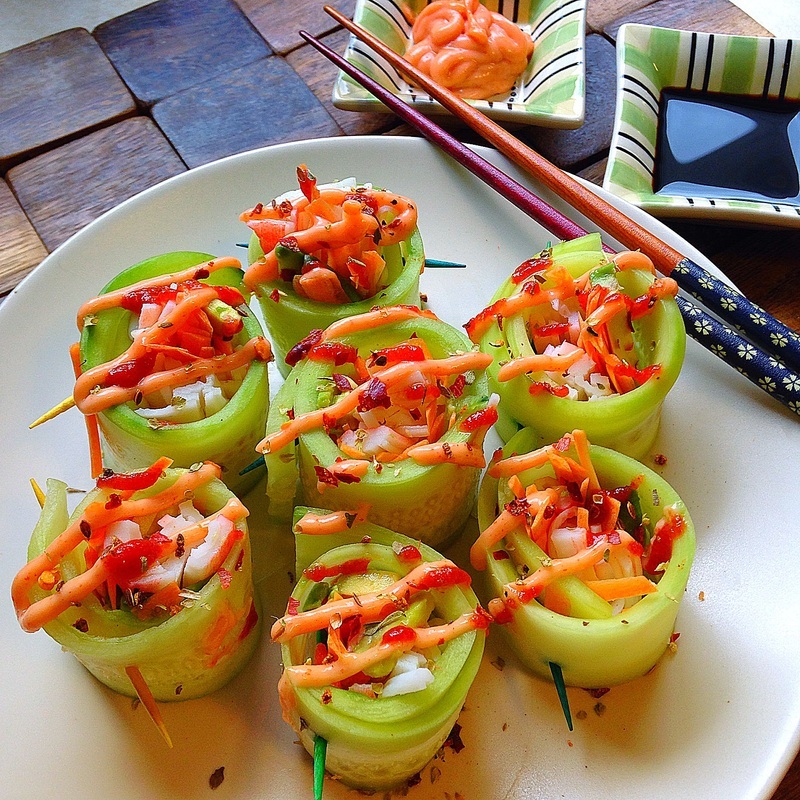 When every roll is stuffed, make the spicy mayo. Put the light miracle whip and siracha into the corner of a zip lock bag and mash it together really well. Cut off the tip of the edge of the bag and squeeze out the spicy mayo over all of the rolls. I sprinkled oregano and six pepper spice on top of everything when I was done and it gave it a nice little kick. Serve it with some soy sauce and the remaining spicy mayo in a side dish. Finally! Something besides chicken is being served in my house tonight! This is a miracle, considering the fact that my husband insists on chicken for dinner every.. single.. day.. I'm thinking seafood for the next 2 weeks. I'm just not sure how well that will play out, but we shall see ;) This dish is finger-licking good. Campari tomatoes are one of my favorites! They're like giant cherry tomatoes and are so sweet and delicious. 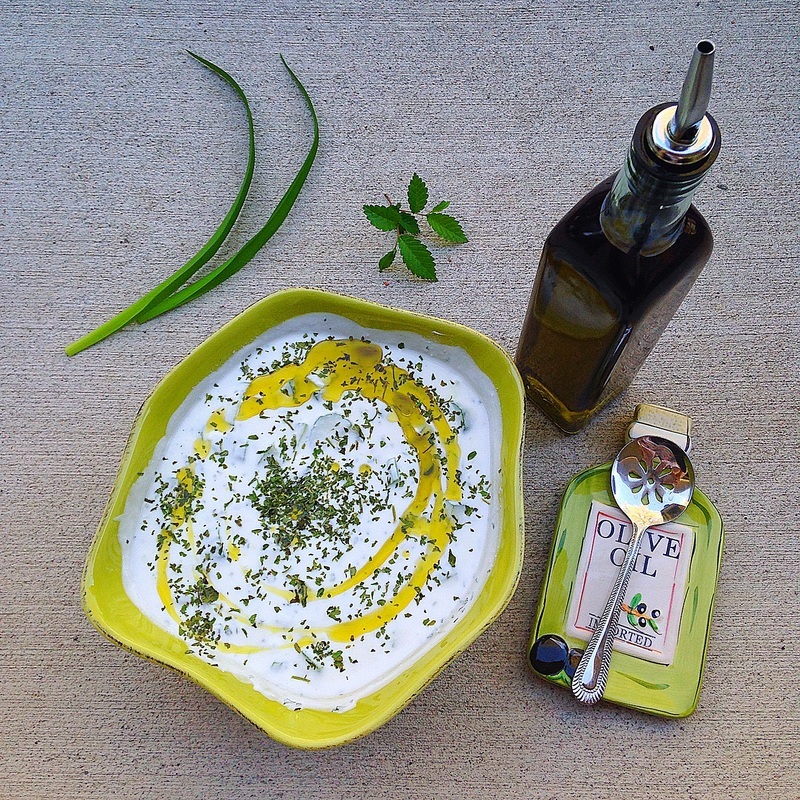 The dill mixed with the feta is such a great combination, I love experimenting with herbs. Preheat the oven to 400 degrees Fahrenheit. In a large frying pan, heat the olive oil on med-high for about a minute and toss in the sliced onions. Cook for 5-7 minutes until the onions are soft, stirring occasionally. Add the garlic and stir for 30 seconds until it gives off a nice fragrance. Add the campari tomatoes and once it starts to simmer, lower the heat and cook until the tomatoes soften and burst open (about 10 minutes). 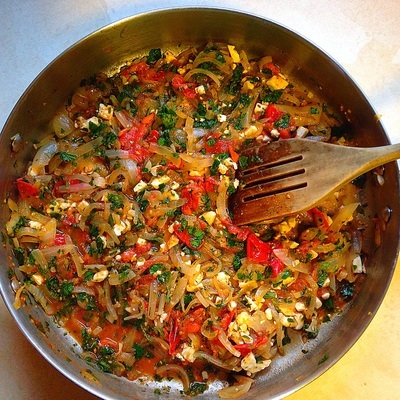 Turn off the heat and mix in the parsley, dill, salt, six pepper spice, oregano, and fat free feta. Spray a baking pan with nonstick cooking spray and evenly spread the tomato-onion mixture on the bottom. 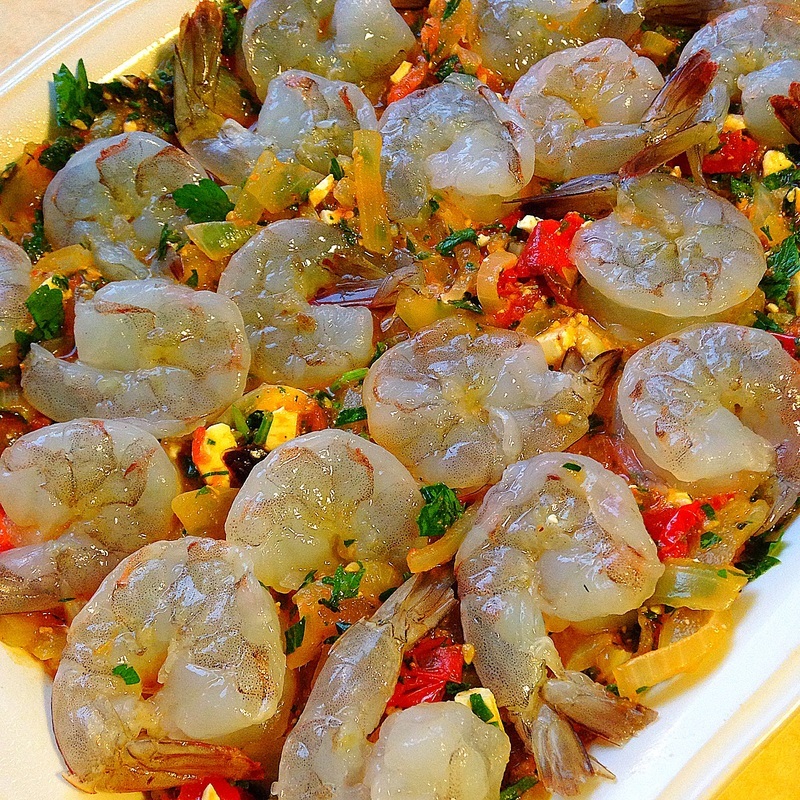 Layer the top with the raw shrimp, pressing them down slightly into the mixture. Bake in the oven at 400 degrees for about 10 minutes, or until the shrimp has turned pink. Make sure not to over cook! 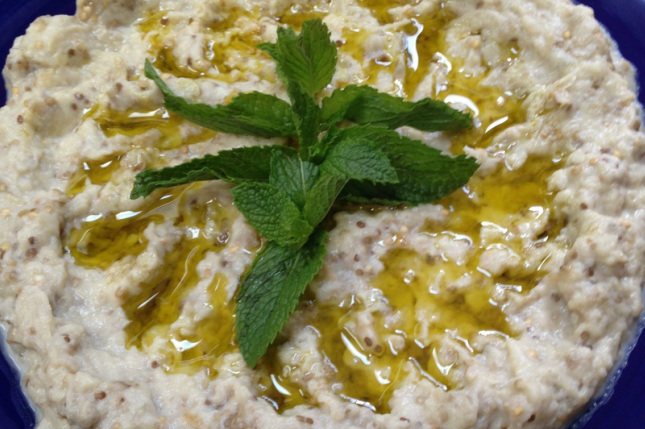 In a large bowl, combine yogurt, water, salt, garlic, and dried mint, and whisk together really well. 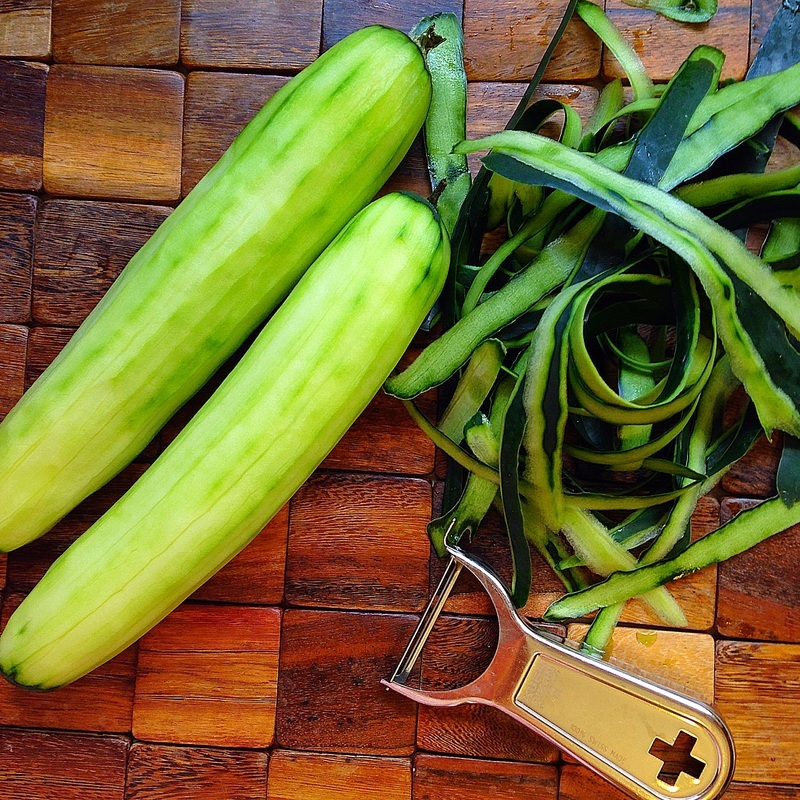 Toss in the cucumber slices and stir. Sprinkle more mint on top and drizzle with olive oil. This beautiful dish speaks for itself. My husband and brother couldn't stop eating it. They both agreed, and I quote, that it was the best pasta they've ever had. I'm not trying to toot my own horn or anything, but I kind of have to agree with them! It's so light, but so decadent. The flavors don't overpower the dish and it's just the best combination ever! Place the angel hair pasta in a deep pot, cover with water, and allow it to boil for 10-15 minutes, or until pasta is done. Dump it into a colander and strain. Remove the ends of the asparagus and discard. Steam the asparagus for 7-10 minutes, leaving it still somewhat crunchy, let cool, and chop into large pieces. In a mixing bowl, add the pasta, asparagus, cherry tomatoes, olive oil, romano cheese, red onion, cilantro, and preferred amount of salt. Mix it all together really well, and serve. If you like mediterranean food you're going to fall in love with this dish. This combination of flavors is mouth-watering and SO delicious! I used dark meat chicken for this recipe because it's obviously much juicier than white meat and it adds more flavor to the dish. 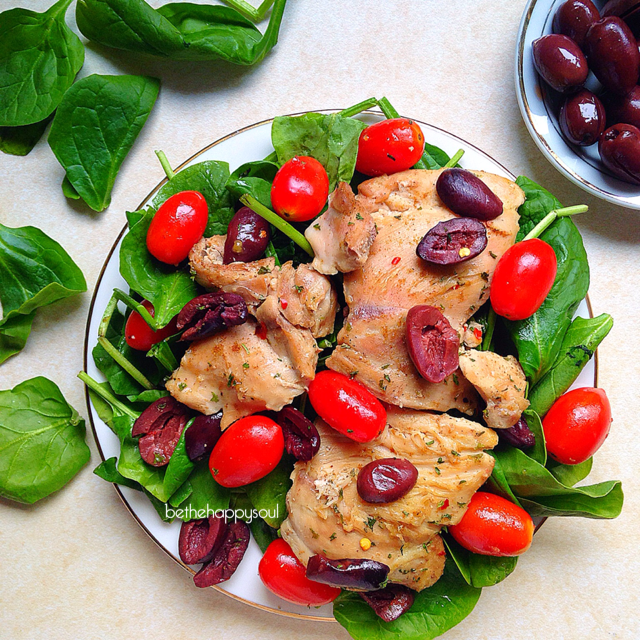 The olives I used here are Kalamata olives, but you could also get away with using green, pimento, stuffed, etc. I served it on a bed of fresh baby spinach but you could also toss in some spinach while the dish is cooking and let it wilt. Heat the olive oil in a frying pan on medium fire. Lay the chicken thighs flat in the pan and cook until meat is no longer pink, flipping occasionally. While it cooks, add the salt, pepper, red pepper, cumin, & parsley and coat both sides of the chicken really well. When the chicken is done and beginning to brown, add the tomatoes and the pitted olives and cook on low heat until the tomatoes soften but before they burst. Serve on a bed of fresh baby spinach and enjoy.